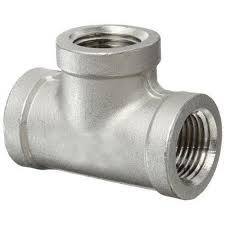 Based in Mumbai, we endeavor to proffer the strong and solid Pipe Tee that provides a three way flow for the liquids. By utilizing the damage-resistant materials in the fabrication process, we have constructed the Pipe Tees that are durable, unbreakable and leakage-proof. We serve the demands of variegated clients by offering the Pipe Tee in requisite specifications. As a reputed Manufacturer and Supplier, we quote very nominal prices for these Pipe Tees.